Sometime last year I took all three of my kids to a bingo night at one of my kids’ schools. On the very last game, Sam (and a bunch of other kids) won. What did they win? They each won a free moonbounce rental from the people who run the aftercare program at the school. Yes. 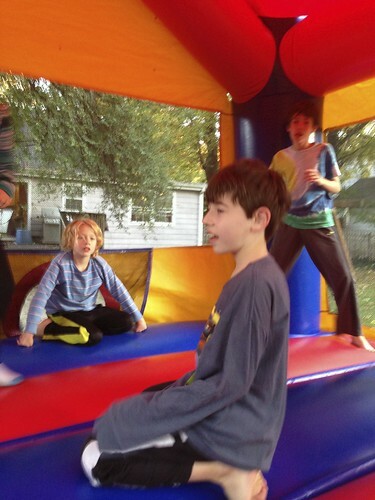 A FREE MOONBOUNCE RENTAL. For my kids. You know of my kids, right? It was like a dream come true. A couple of weekends ago, we had a few friends over, put out some Doritos and Oreos, and JUMPED. I made the mistake of going into the thing when all the kids were in the midst of their sugar-induced hysteria, which was a huge mistake. They turned on me—and they turned on me fast. “Get the adult!” they screamed. Then they knocked me over and stole my socks. I barely made it out of there alive. Later, when there were just my kids and a couple of their friends, I ventured back in. It was so great. So, so great. I jumped in that thing for, like, an hour. I haven’t had that much fun in a long time. Jumping and laughing with my kids and our last guests was exhilarating. It was such a blast. I work hard to make sure my kids have fun, but all too often, instead of participating in the fun thing, I watch them having fun. I think I’m going to have to remember this—sure, it’s awesome to watch my kids have a blast, but it’s even better to have a blast with them. I want to give a huge shout out to Carnival Day, the party rental arm of Kids After Hours. They were super wonderful and flexible and easy to work with, especially considering we weren’t paying them a dime. Plus, they’re the kind of people that donate a slew of free moonbounce rentals to an elementary school bingo night. 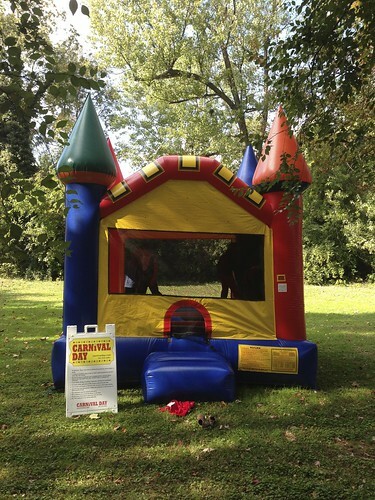 If you are looking for a moonbounce or any of the other big party items that they rent, definitely work with them. They are fabulous.